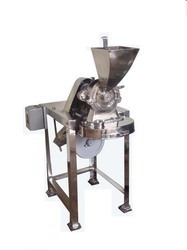 For coarse to fine dry and wet grinding of all types of chemicals, coal, colors, cosmetics, dyes, food colors, fertilizers, gum, gram flours, manures, minerals, medicinal herbs, pharmaceuticals, plastics, paints, pigments, pesticides, sugar, spices, salt, tea pre-mixes etc. 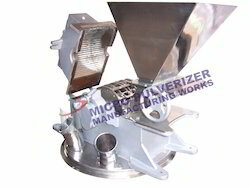 PRINCIPLE OF PULVERISING:- Shubh micro pulverizer is compact, low cost, highly efficient grinding mill, capable of grinding variety of products from coarse to fine mesh size. Material to be pulverized is crushed between high speed moving beaters and serrated liner and by impact between rapidly moving beaters and the particle itself, the energy of the rapidly moving beaters dissipating itself into the particles being ground by virtue of their inertia, thus causing the particles size reduction. We are one of the leading manufacturers , exporters & suppliers of Shubh Micro Mini Pulverizer. Grinding Chamber: MOC - Stainless Steel / M.S. Dai. 5" chamber with special serrated S.S.Liner on the Top and perforated Screen groove at the bottom. Feeding : Through Stainless Steel/M.S. smooth finished Gravity Feed Hopper. Rotor Assembly : Stainless Steel/ EN-8 Rotor Shaft with 6 special S.S./ M.S. Beaters fitted in two heavy duty Ball Bearings. Power Required : 1 .5 H.P. Electric Motor for rotor drive. Base : SS/ M.S Structure fabricated out of Angle frame to mount the Pulverizer and Electric Motor. Accessories : 'V' Belts, 'V' Belt Pulley, Cotton Bag, Balloon and three different types of sieves. 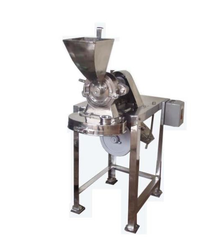 PRINCIPLE OF PULVERISING- Shubh micro pulverizer is compact, low cost, highly efficient grinding mill, capable of grinding variety of products from coarse to fine mesh size. Material to be pulverized is crushed between high speed moving beaters and serrated liner and by impact between rapidly moving beaters and the particle itself, the energy of the rapidly moving beaters dissipating itself into the particles being ground by virtue of their inertia, thus causing the particles size reduction. MOC - Stainless Steel/MS Dai. 5" chamber with special serrated Liner on the Top and perforated Screen groove at the bottom. 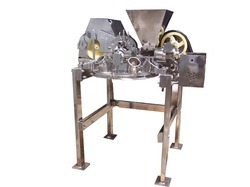 Through Stainless Steel/MS Feeder Screw with reduction gear and Variable Pulley. Wide and smooth finished Stainless Steel/MS Feed Hopper. Stainless Steel/EN-8 Rotor Shaft with 6 special Stainless Steel/MS Beaters fitted in two heavy duty Ball Bearings. 2 H.P. Electric Motor for rotor drive & 0.5 H.P. Electric Motor for Feeder drive. Strong M.S. Structure with four legs for mounting the Pulverizer and Electric Motor. 'V' Belts, 'V' Belt Pulley, Cotton Bag, Balloon and three different types of sieves. MOC - Stainless Steel / M.S. Dai. 8.5" chamber with special serrated S.S.Liner on the Top and perforated Screen groove at the bottom. 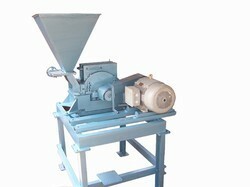 Through M.S/SS Feeder Screw with reduction gear and Variable Pulley. Wide and smooth finished M.S./SS Feed Hopper. Stainless Steel/ EN-8 Rotor Shaft with 6 special S.S./ M.S. Beaters fitted in two heavy duty Ball Bearings. 5 H.P. Electric Motor for rotor drive and 0.5 H.P. motor for feeding. SS/ M.S Structure fabricated out of Angle frame to mount the Pulverizer and Electric Motor. MOC - Stainless Steel / M.S. Dai. 11.5" chamber with special serrated S.S.Liner on the Top and perforated Screen groove at the bottom. 10 H.P. Electric Motor for rotor drive and 1 H.P. motor for feeding. MOC - Stainless Steel / M.S. Dai. 16" chamber with special serrated S.S.Liner on the Top and perforated Screen groove at the bottom. Stainless Steel/ EN-8 Rotor Shaft with 48 special S.S./ M.S. Beaters fitted in two heavy duty Ball Bearings. 20-25 H.P. Electric Motor for rotor drive and 1 H.P. motor for feeding. Feeder Drive (Horsepower) 2 H.P. MOC - Stainless Steel / M.S. Dai. 24" chamber with special serrated S.S.Liner on the Top and perforated Screen groove at the bottom. Stainless Steel/ EN-8 Rotor Shaft with 96 special S.S./ M.S. Beaters fitted in two heavy duty Ball Bearings. 50 H.P. Electric Motor for rotor drive and 2 H.P. motor for feeding. 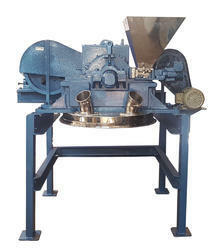 Excellent for Grinding various types of Food, Spice, Pharmaceutical and herbal material from coarse to fine mesh size.